Chimé Rigdzin Rinpoche (C. R. Lama) (1922-2002) was born in 1922 in the Kham Region of Tibet. When he was 4 years old, several lamas, including the Thirteenth Dalai Lama, Minling Trichen and Sakya Trizin confirmed him to be the fourth incarnation of the great Tertön Nuden Dorje Dropen Lingpa. Chimé Rigdzin Rinpoche was enthroned at Khordong Monastery in Kham, Tibet at the age of 4. He was educated in mandala design, grammar, philosophy and tantra. At the age of 7 he began to display many miracles. It is said, that he left footprints in a rock and crushed a rock with his bare hand. Also at 7 he discovered his first terma. He completed his education at the age of 19 with the degree of Dorje Lopön Chenpo (Mahavajracharya). Then, on the advice of his guru Tulku Tsullo, he left the monastery to enter into the traditional three-year retreat at Tso Pema. Following that he visited all the Buddhist pilgrimage sites in Tibet, Sikkim, Bhutan and India as monk and wandering ngakpa. 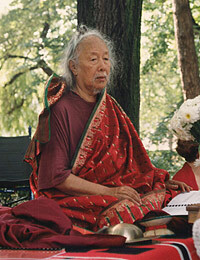 From 1954 to 1987 Rinpoche was Head of the Department for Indo-Tibetan studies at the Visvabharati University at Santiniketan in West Bengal, India. In the late 50's he was invited by Professor Tucci to teach in Rome. During that time he met H.H. Pope John XXIII. In the following year he was invited to teach at the University of Munich by Prof. Hofmann. During his journey to Tibet in 1985 he became known as the Rainbow Lama, because wherever he went rainbows would appear in the sky. The Mahabodhi Society of India awarded him the honorary title of Bodhisattva for his meritorious activities and for spreading the Dharma. Since his retirement in 1987, Rinpoche regularly visited Europe, where he guided a small but devoted group of pupils. Rinpoche was considered to be the mind emanation of Padmasambhava. This page was last edited on 15 February 2018, at 20:18.